Basella alba, or Malabar spinach, Malabar nightshade, Alugbati or Alabati in Philippines, (also Phooi leaf, Red vine spinach, Creeping spinach, Climbing spinach, Indian spinach, Philippine Spinach, Asian Spinach) is a perennial vine found in the tropics where it is widely used as a leaf vegetable. Basella or vine spinach is a popular tropical leaf green vegetable commonly grown as pot herb in the home gardens. In the true sense, it is different from English spinach) in that the plant is a creeping vine, and its leaves feature glossy, broad, deep green, thick, and mucilaginous. Vine spinach belongs to the Basellaceae family and has two chief cultivars, Basella alba, which features green-stems and deep-green leaves, and Basella rubra with purplish-stem and deep-green leaves with pink veins. Basella alba is a fast-growing, soft-stemmed vine, reaching 33 ft in length. Its thick, semi-succulent, heart-shaped leaves have a mild flavour and mucilaginous texture. The stem of the cultivar Basella alba 'Rubra' is reddish-purple. The green leafy vegetable is a rich source of vitamins like vitamin A, Vitamin C, Iron and Calcium. They are great for salads as they are low in calories and rich in protein. Typical of leaf vegetables, Malabar spinach is high in vitamin A, vitamin C, iron, and calcium. It is low in calories by volume, but high in protein per calorie. The succulent mucilage is a particularly rich source of soluble fiber. Among many other possibilities, Malabar spinach may be used to thicken soups or stir-fries with garlic and chili peppers. In the Philippines the leaves of this vegetable is one of the main ingredients in an all vegetable dish called utan that is served over rice. In Karnataka Cuisine (Karavali and Malnad regions), the leaves and stems are used to make Basale Soppu Saaru/Curry (Especially in combination with Jackfruit seed). In Bengali cuisine it is widely used both in a vegetable dish, cooked with red pumpkin, and in a non-vegetarian dish, cooked with the bones of the Ilish fish. In Andhra Pradesh, a southern state in India, a curry of Basella and Yam is made popularly known as Kanda Bachali Koora [Yam and Basella curry]. Also it used to make the snack item bachali koora bajji. In Odisha, India, it is used to make Curries and Saaga (any type of dish made from green leafy vegetables is called Saaga in Odisha). In the Western Ghats in Maharashtra, India, it is used to make bhaji. The vegetable is used in Chinese cuisine. It has many names including flowing water vegetable. It is often used in stir-frys and soups. In Vietnam, particularly the north, it is cooked with crab meat, luffa and jute to make soup. In Africa, the mucilaginous cooked shoots are most commonly used. 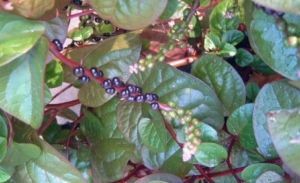 Malabar spinach can be found at many Chinese, Vietnamese, Korean, Indian, etc. grocery stores, as well as farmers' markets. It has been shown to contain certain phenolic phytochemicals and it has antioxidant properties.